What will my app do? Many people find the home of their dreams when they drive, or walk, right past it. Your app will allow them to find that listing immediately with GPS based searching. Your users will see themselves, and all the nearest listings, directly on the map. From there, they may select a listing to see a bit of information. They may also select to see detailed information. 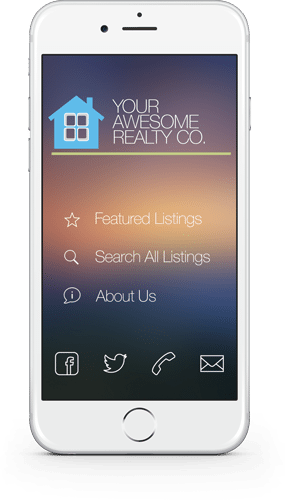 100% IDX Compliant, your app will allow your users to search every listing in your local MLS. When registered, users can save as many of their favorite listings to as many lists as they’d like. All calls, all emails go directly to you. The single agent app directs all communications to the number/email you setup. The agency app allows the user to select their agent. Once selected, all communication goes directly to the correct agent. Your listings are featured upfront. 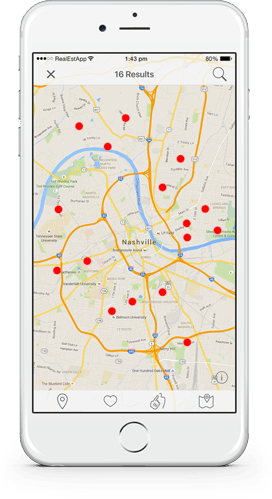 With one tap, your users will be taken to a map filled with only your listings. Don’t have any right now? No problem! Within your admin panel, setup the search you would like your users to see. Know exactly who your users are, what they are doing, and what they need from you. * Pricing available as low as listed. Please get in touch to see how much your app would be in your area. Minimums may apply. Copyright © 2015 MyRealtyShowcase.com, LLC. All rights reserved.